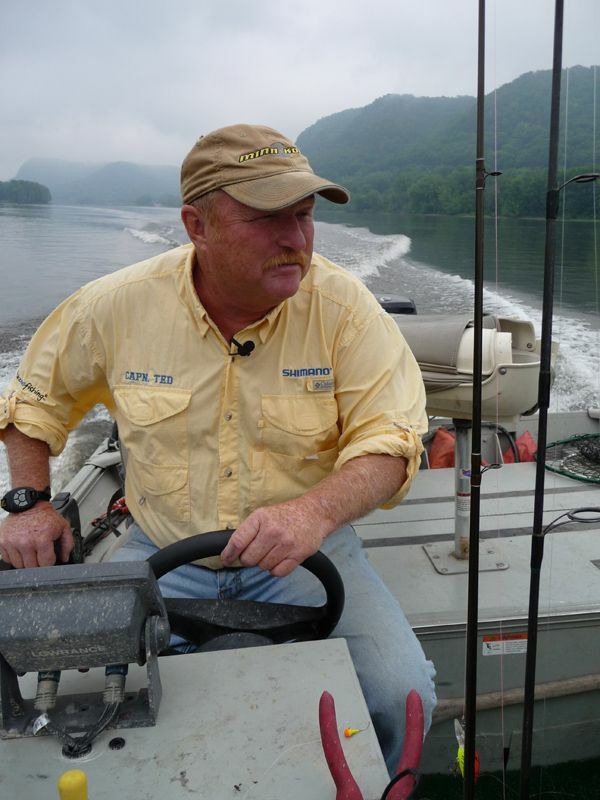 Rolling on the river with Captain Ted Peck. 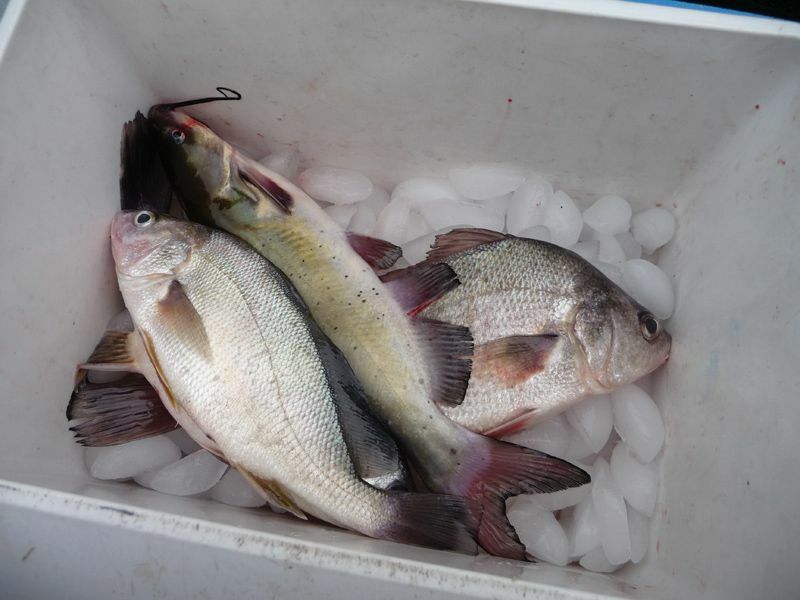 OK, I’ll admit it – they’re not the prettiest fish Mother Nature ever came up with, but the Freshwater Drum, a.k.a. “Sheephead”, is one of the most underrated, hardest-fighting, best-eating fish to ever ply the Mississippi River watershed. They’re often categorized with other less desirable fish like carp and suckers. What’s not to love? Drum are prolific, tenacious, easy to catch, seemingly immune to seasonal and weather changes on the water, and delicious table fare. For those not familiar, drum are common inhabitants of river systems throughout much of the country. I’ve caught them trolling crankbaits for walleyes on the Fox River near the mouth of Green Bay, jigging for early spring walleyes on the middle section of the Wisconsin River, and now on the Mississippi where we were actually targeting them. Drum are voracious feeders that have no problem pouncing on a fast-retrieved artificial or delicately slurping a crawler or minnow right off your jig hook. A great size for eating would be in the 10″ to 16″ range, but these disc-shaped powerhouses can grow to over 30 lbs. The day before we fished with Ted he was pre-fishing the same stretch of the river and said he caught and released a “Mongo” (with apologies to “Blazing Saddles” fans) sized drum that was pushing 25 lbs. He caught it on a baitcasting reel spooled with 20 lb. test Fireline and said it was a 10 minute battle that wore him out. The biggest we boated was around a 10 pounder, followed by a couple in the 5 – 7 lb. range. They were all classic fights with plenty of give and take, clicking drags, and rainbow shaped rods. As Ted pointed out, “If you come to this river with a catch and release ethic and want to hook into a big powerful fish that’ll stretch your string, why would you NOT consider going after a sheephead. Our shepherd, err… guide, was Captain Ted Peck of Lancaster, Iowa. Ted is an outdoor writer and licensed guide who constantly reminded us of how cool it is to make one’s living in the outdoors. He’s also an amateur comedian who has more jokes and one liners than Carter has pills. With his red hair and mischievous smile, you get the feeling you’re out on the water with a little kid who’s made a career out of playing hooky. A day on the river with Cap’n Ted isn’t something you’ll soon forget. So far I’ve only mentioned the larger fish that were released, but we put some smaller fish in the cooler too, and that’s key – Ted says the best way to guarantee a tasty and flaky fillet is to immediately ice down the smaller fish that you keep. It preserves the flavor and prevents spoilage in the warmer summer temps. Even a circulating live well can be pumping water that’s anywhere from the upper 60s to mid 80s and can taint the meat. Ice is the way to go. A lead head jig with a stinger hook and baited with a piece of night crawler works great on drum. I suppose you’re wondering just how those fish got in the cooler? Well, it couldn’t have been much easier. We used 1/4 to 1/2 ounce lead jigs in a variety of patterns (some even bare) that were tipped with about a third of a night crawler and a small treble stinger hook. We followed the bubble line and drifted with the current while vertical jigging in 15 – 25 feet of water, just touching the bottom before raking the rod tip up about 3 feet and then letting it settle back to the bottom. The most common scenario is that the drum would take it on the drop with a quick tap-tap-tap motion that reminded me of a slow motion version of a yellow perch bite. Our rods had a variety of line types ranging from 8 lb. mono to 20 lb. Fireline. Lighter tackle is plenty for the smaller, keeper-sized fish but on the chance that you tie into a hog, it’s good to go towards a stouter rig. Remove just the back straps of the drum to avoid the rib bones. 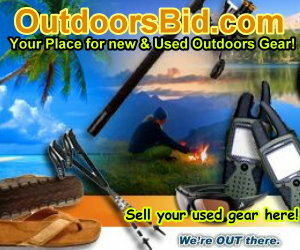 OK, Ted proved drum were easy to find, easy to catch, and they could put a tight bend in the rod. Now it was time for him to prove his final claim – that drum are as good or better on the table as anything else that swims in the river. 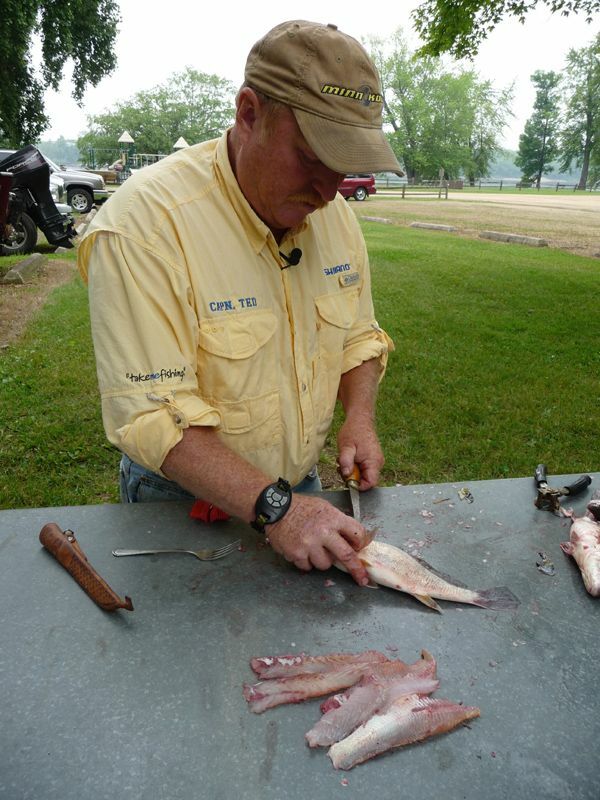 He demonstrated the fillet technique that takes only the back straps, which he calls “fish sticks” while ignoring the belly meat commonly saved on a walleye or catfish. While we didn’t keep any walleyes, we did boat one small catfish that went in the pan as a taste comparison. The fillets were rolled in a seasoned breading and fried in a cast iron skillet on a camp stove. And yes, they were delicious! I’d eat another meal of batter fried sheephead any day! 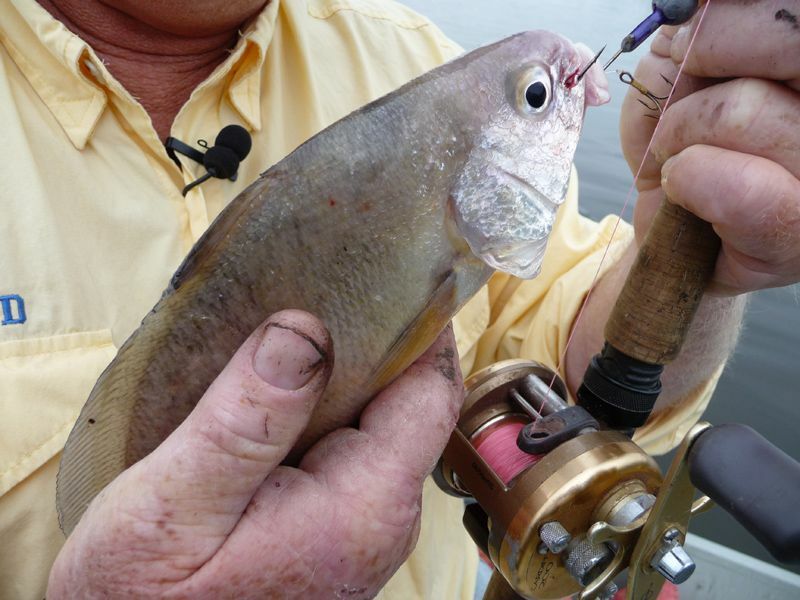 So, you walleye, perch, and bluegill snobs – stop looking down your nose at a “rough” fish like freshwater drum. Whether you’re fighting them or eating them, it’s time to march to the beat of a different drummer.